Apparently I'm a little late getting in on the action, but it seems that the rest of the world has already long been enjoying the rich, delicious, eat-it-straight-from-the-jar chocolatey goodness of Nutella. It's not that I hadn't heard of it before (and I'm pretty sure I had it in a crêpe in Paris many, many years ago), but why I hadn't picked up a bottle right there off the shelf at my local grocery store until recently? It'll remain a mystery, I guess. 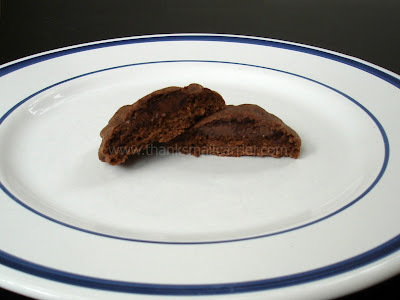 But as well as just eating it off of my spoon (even though I was having a good time doing that), I wanted to take things a step further and found a recipe for Nutella Lava Cookies that I had to try. 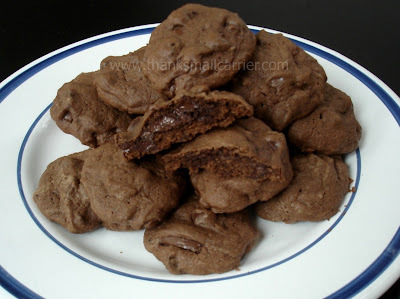 I didn't find that they turned out much like lava, so I think a better name is Chocolate Nutella Surprise Cookies because it's like a yummy surprise burst when you bite into them. I've already eaten far too many, but really, is there ever too much chocolate? If you're a snazzy baker, line your baking sheets with parchment paper or silicone baking mats. If you're like me, just brush off your regular old cookie sheets and you're set to go. Cream the butter and sugar on medium-high speed until light and fluffy, about 2-3 minutes. Blend in the eggs one at a time, scraping down the bowl as needed. Mix in the cocoa powder at low speed until well blended. Add the flour, salt and baking powder to the bowl and mix on low speed just until incorporated. Stir in the chocolate chips. Original instructions: Scoop up about 2 tablespoons of dough and roll it into a ball. Flatten the ball in the palm of your hand and put about ½ tbsp of Nutella in the middle of the dough. Then wrap the edges around to form a ball and to cover the Nutella completely. My take: My dough was like normal, sticky cookie dough and there was no way that I was going to be able to roll it into a ball, even if I added some flour. Instead, I took about 1 tablespoon of dough and flattened it on the sheet, added a dollop of Nutella, and then placed a second tablespoon of dough on top. Using the spoon, I ran it around the edges to form enough of a seal that the Nutella wouldn't leak out when baking. *just stumbled and 'pinned' this recipe!!! OMG,I have to try to make those! Thanks for the recipe...I was raised on nutella but never baked with it. Oh my! These look really chewy and gooey! I love all the chocolate in there. Now that you have my address....make it happen. I insist. 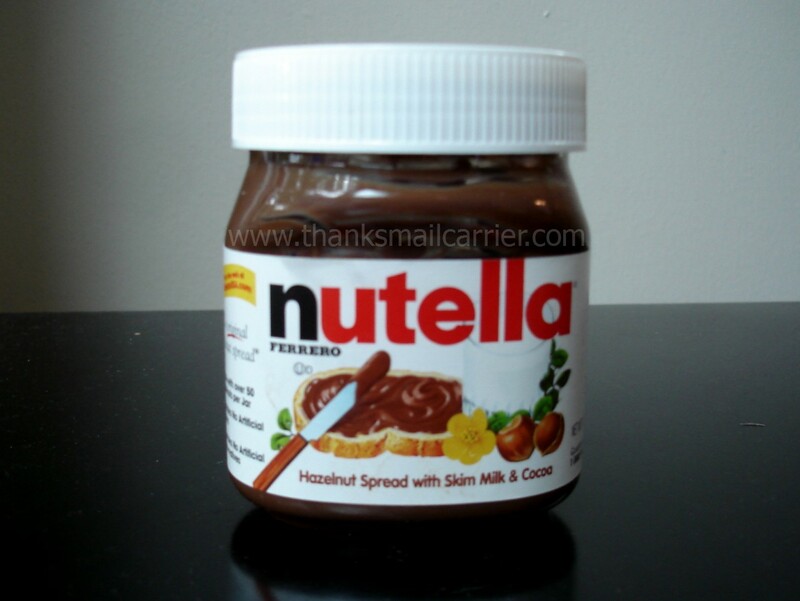 I a not surprise that people love Nutella, I myself enjoy it and cant get enough of it. Much more if they are made to cookies. The crispness and the chocolatey flavor are hard to resist. Thanks a lot for the recipe. These cookies are out of this world! Thank you for sharing the recipe with us! Hi! Using Nutella as filling for chocolate cookies is both delicious and a great idea. I remember when I was in Italy few years ago, I used to devour several spoons of it everyday and eat it along with hard panini (bread). Thanks for sharing the recipe! I will surely try it during the weekend. 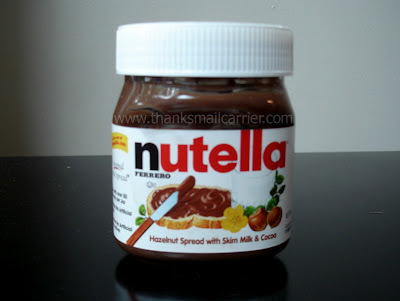 i cant believe all the recipes i have been seeing lately using 'nutella'. you cant go wrong with anything that tastes like chocolate. my grandsons love the stuff. they like to spread nutella and marshmallow fluff on a warm flour tortilla.